Here is a list of upcoming events and training seminars. If you have a special request not listed below. Please email dave@cleanprosupply.com to share your suggestions and special requests. Our goal is to provide the best possible education, support, and supplies you need to succeed! Space is limited, please call 585-426-9507 or scroll down to see links to register online and reserve your seat today! If you are looking for an edge on the local competition for your business, this may be just the opportunity you are looking for. 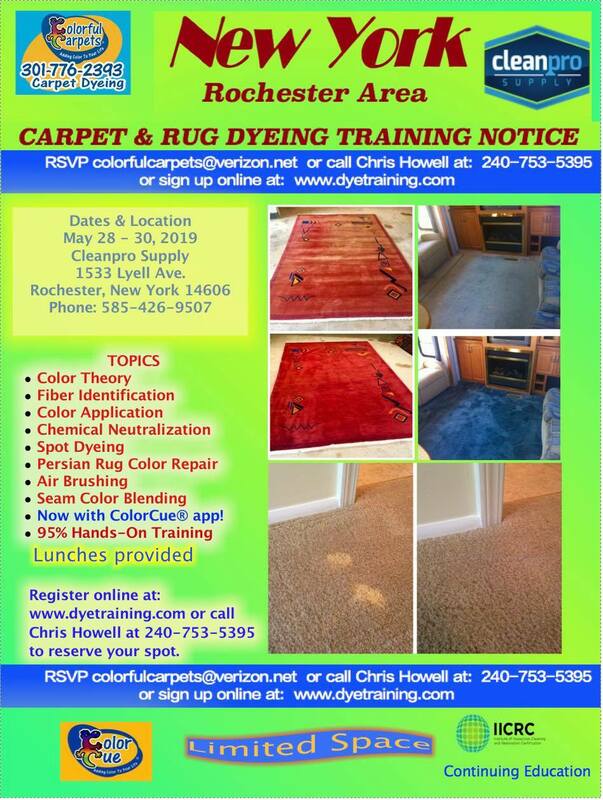 Chris Howell’s carpet and rug dyeing courses are designed to teach you and your business how to develop the dyeing and restoration skills that brought Howell and Colorful Carpets international recognition. This traveling intensive course turns cleaners and restoration professionals into specialists, with the skills that Howell has used in working in the United States White House, Palaces in Dubai, and other prestigious locations around the world. Become a specialist among specialists. Cost: $25 per person, transfer for in store credit on the day of the class. Learn proven strategies used by cleaners worldwide. Includes fiber identification, advanced spotting techniques and streamlined cleaning procedures that leave customers happy and strengthen your bottom line. Excellent for new technicians and for seasoned professionals.